Basketball Manitoba is pleased to launch a new initiative aimed to attract more young people into becoming a new basketball referee or coach. The 'Be a Ref' promotion is targeting young adults in the 18-25 age range to continue with the sport this April in a different capacity. With most people in this age range seeing their basketball involvement coming to end, we want to open another chapter with your love for the game of basketball! 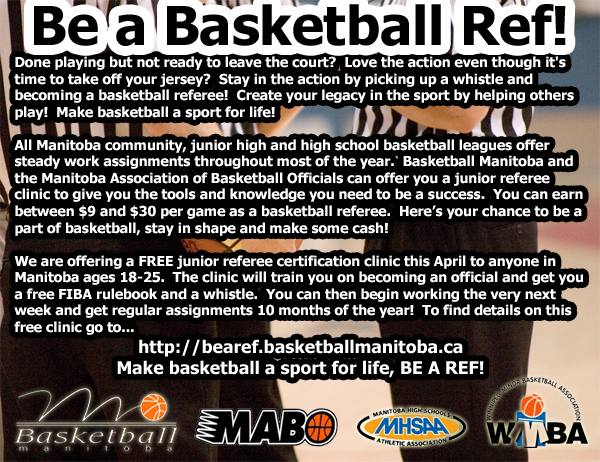 Basketball Manitoba, MABO, WMBA and MHSAA are offering a free referee clinic to these people this April to make basketball a 'sport for life'. Thanks for making the decision to get involved as a basketball referee and making basketball a sport for life! We want to get you off and running with the right information and skills and make this a life long experience! Basketball Manitoba in partnership with MABO, WMBA and MHSAA is offering a FREE full day 'Junior Officials Development Program' (JODP) basketball clinic for any anyone ages 18-25 in Manitoba. This clinic normally costs $90.00 a person to attend. These clinics will cover such aspects as game rules, floor mechanics, hand signals, referee philosophy and more. The clinics will be based on the current FIBA (international) rules system only. 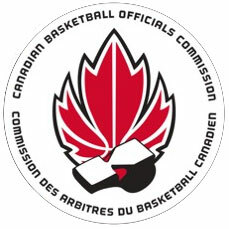 Upon completion, you will be a certified "Junior Basketball Official", by the Manitoba Association of Basketball Officials (MABO). Those that become certified will be eligible to officiate in the WMBA this spring. You will need to re-certify again this fall to continue as an official. PLEASE REGISTER BELOW. Can't see the form? CLICK HERE to view it in a new window. Make Basketball a Sport for Life!